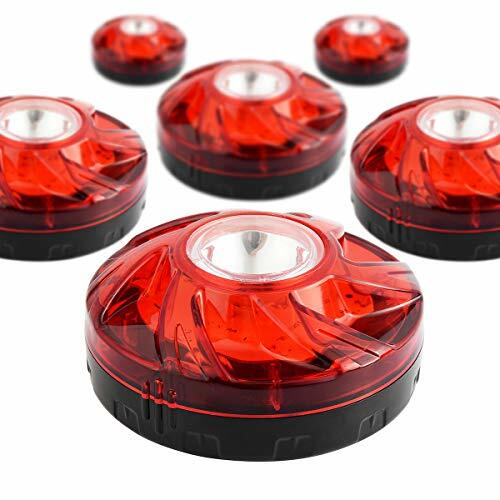 6 Pack LED Road Flares Flashing Warning Light Roadside Flare Emergency Disc Beacon, Magnetic Base for Car or Marine Boat(Batteries not included). 1. Hook design make it easier to hang wherever you want. Strong Magnetized base makes the emergency beacons stick to cars firmly. 2. Water resistant, shockproof, crush proof. Saviour for car breaking down or stranded on a dark, it can also as a warning to other drivers. 3. Different flashing modes suitable for different emergency situations. - Material: ABS, Engineering Plastic, Magnet. - Rainproof, shatterproof, crushproof. A must have for car trunk emergency or motorcycle bicycle emergency. - 9 Flashing Modes: Rotate, Quad flashes, Single blink, Alternating blinks, SOS rescue (Morse code), Steady on-high, Steady on-low, 4 LED Flashlights, Top LED Flashlight. 1. Short press the button to turn on and long press for about 3 seconds to turn off the warning light. 2. Short press the button to switch light mode. High Quality Material - LED Road Flares are made of environmental protection ABS which makes the LED warning light shatterproof, crush-proof and rainproof, perfect for auto car trunk emergency, boat or bicycle emergency. Hook and Strong Magnetized Base - These emergency flares come with a hook for you to hang it anywhere you want, which is very convenient. The super strong magnet ensures that light will stay in place on an iron metal surface such as a car body, car bumper, or road sign. This emergency flare is shockproof and water-resistant, good for winter or motorway or country roads, ideal for car breaks down or stranded on a dark, as a warning to other motorists. Visible for up to 1 mile and help augment standard hazard lights. Can even be placed inside a traffic cone for the ultimate safety zone. LED very bright, has different flashing patterns, strong magnet and a hook design for hanging to wherever, not only for car. Note: Please remove the insulating strip for the first time use. Please check the main photo for your reference. 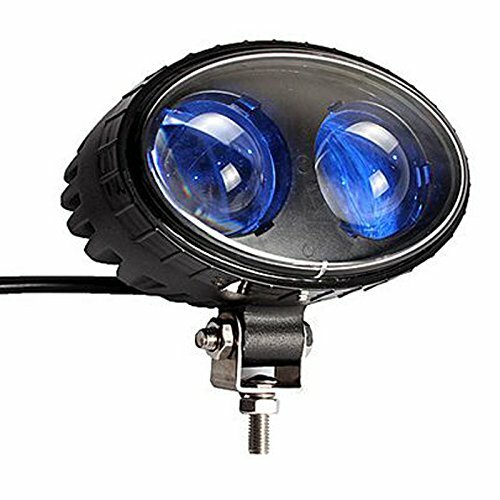 Solid Construction : IP 67 waterproof, anti-collision, anti-rain, anti-pressure LED flare lights is the vehicle, bicycle, ship emergency necessary tools. Package incldues: 6 Pack LED Road Flares. Multipurpose: It can be used for traffic control, as a warning light, as a rescue beacon, and in any other emergency situations. Also as a great tools for outdoor activities such as camping, hiking, boating, cycling, etc. 9 Different flash modes, including SOS rescue and 3 LED flashlight. Provide 9 warning lights to help different situations. Note: Please remove the insulating strip for the first time use. The main photo for your reference. Warranty: 2 Years Warranty, 90 Days Money Back Guarantee! 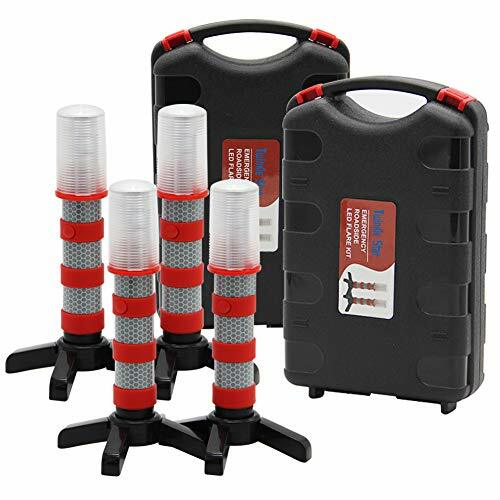 Tobfit 6 Pack LED Roadside emergency Flares lights work by visually alerting others with bright, flashing lights. Guarantee Your Safety and family members In Case Of A Road Accident; A real life-saver in case of a water accident, capsizing or similar emergency, our LED beacons are a must have for all cars, SUVs, Jeeps, motorcycles, bicycles and marine boats. *High Quality Material: LED Road Flares are made of environmental protection ABS which makes the LED warning light shatterproof, crush-proof and rainproof, perfect for auto car trunk emergency, boat or bicycle emergency. *Multiple attachment options: Strong neodymium magnet Ensures that light will stay in place on an iron metal surface such as a car body, car bumper, or road sign. Retractable hook allows hanging or use as a kickstand. *Different Flashing Modes: They have 9 selectable warming flashing light patterns including strobe, rotating, SOS and 3-LED flashlight. Use them in bad weather such as rain, fog and snow. *Convenient and durable storage bag to keep emergency lights flares organized and ready to use in your car or trunk. 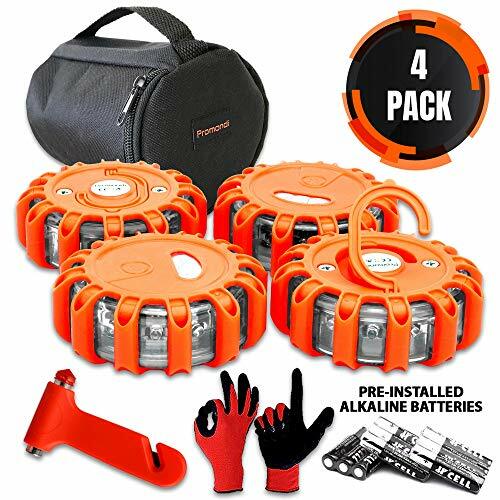 FAMILY PACK - Pack of 6 LED Road Flares Emergency Light with Storage Bag great for dividing up among family members; A Perfect Emergency Kit to keep in the trunk of their vehicles for Roadside emergencies and distress situations. (We recommend AAA batteries to these LED flares light | BATTERIES NOT INCLUDED). BRIGHT LEDs Light - The LED car Emergency road flares warning lights feature a super bright red/orange LED light for extra visibility, It can be seen up to 1 mile at night and radiate outward 360 degrees to warn other drivers on the road to slow down and approach safely. Protect yourself and your loved ones! 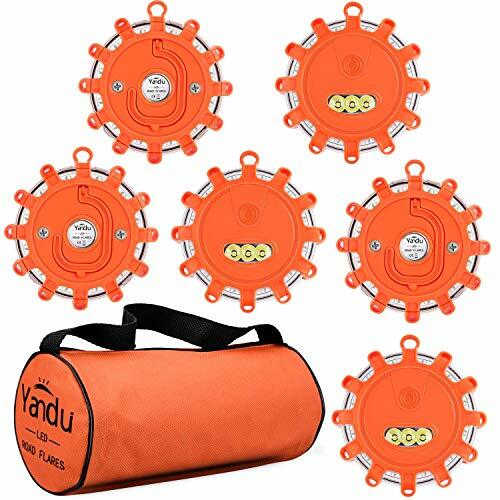 9 DIFFERENT EMERGENCY FLASHING MODES - Each LED Safety flare fred light has 9 flashing modes for different SOS rescue signals both for marine and road emergency use. They can also be used for recreational activities such as camping and hiking; It is also perfect for failed vehicle traffic warning, police road mark, surface float and maritime salvage identifier etc. 100% SATISFACTION GUARANTEED - Enjoy a risk-free purchase and buy with confidence with our warranty. We stand behind our products quality and functionality. If you are unhappy with 6*LED Flashing Warning Light, return it for a hassle free 100% refund for up to 180 days.  ARE YOU PREPARED FOR A SUDDEN STOP? In recent years, the number of pedestrian fatalities in the United States has grown substantially faster than all other traffic deaths. The number of pedestrian fatalities increased 27 percent from 2007 to 2016, while at the same time, all other auto traffic deaths decreased by 14 percent. Pedestrian deaths as a proportion of total motor vehicle crash deaths increased steadily, from 11 percent in 2007 to 16 percent in 2016. Pedestrians now account for a larger proportion of traffic fatalities than they have in the past 33 years. We Want to Decrease the Fatalities. We Want to Save You & Your Loved Ones. The flashing roadside emergency kit is generally used as broken vehicle traffic warning, police street mark, identification for emergency vehicle discovery, marine rescue identifier, keep away warning, large and heavy vehicle transport cautioning, emergency rescue identification, campground or climbing identifier, open-air lighting, boating, cars and so on. Safe to use in many situations. [THE ORIGINAL SAFETY FLARE] - We are the #1 selling LED safety flare in America. This compact orange LED light emits 360 degrees of ultra-bright light from an array of 15 ultra-bright LEDs, visible for miles at night. The Haylo Safety Flare has 9 flashing patterns, including the U.S. Coast guard approved SOS (Morse code) and LED flashlight at the top of each unit. Every motorist should have these in their vehicles. [HIGH VISIBILITY] - 15 super bright LEDs (12 amber, 3 white), combined with 9 unique light modes, will ensure that you're seen by passing cars up to a mile away & can easily signal for assistance. Our car emergency lights make the perfect gift! [QUICK & EASY BATTERY CHANGES] - Our emergency road flare kit includes detailed instructions allowing for simple battery changes - even on the go! Our lighting mode memory feature, and non-scratching powerful magnetic back make us the #1 seller of safety flares. 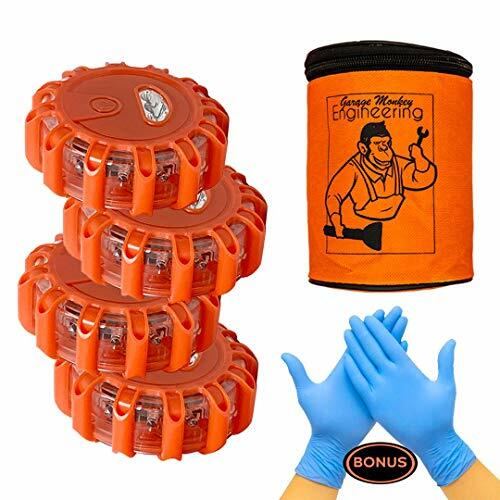 [WATERPROOF, CRUSHPROOF & MAGNETIC] - Leave your safety flares in the pouring rain or run them over with your car - they're built to last! Plus, super strong rare earth magnets will keep them secured to the side of your truck or RV. [FAMILY APPROVED] - Our emergency flares are safe, reusable & easy to use - without the risk of fire or burns. 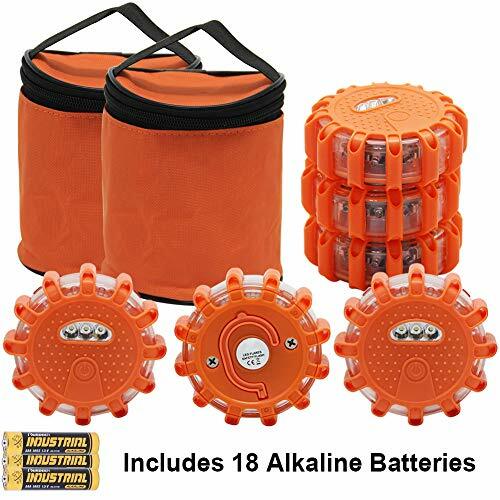 The best accessory for any motorcycle, bicycle, boating or car emergency kit. LED emergency lights for vehicles are a must have! Yacker Tracker Noise Level Monitor Detector uses a LED traffic light to signal appropriate noise levels. Select the appropriate sound level for any given situation and let the Yacker Tracker be an audio-visual reminder when the noise level gets too high. Choose either siren sounds or voice Quiet Please available in 4 different languages! Green = Noise Level is ok; Yellow = Caution; Red = Quiet Please. 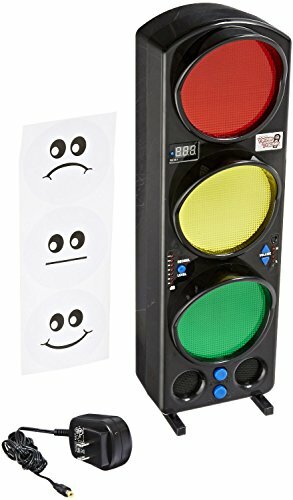 Optional face stickers add a visual element of emotion to the LED signal lights. Great for Schools, Classrooms, Cafeterias, Hospitals and anywhere noise levels should be monitored. Great for the hearing impaired! Can be self-standing or wall-mounted. Why choose twinkle star LED roadside flare lights? Bring with twinkle star road warning light in your car may save your life. Highway signal alert with magnetic base fit in upright stand or any magnetic material like car surface. the ideal safety option for all applications. Requires 12 AAA batteries(battery included). Please remember change batteries after months. High Visibility: The super-bright red LED array could see a mile view at day and night. Provide 3 different flash modes: Strobe(SOS)/Flashlight/Solid. Multipurpose: It can be used for traffic control, as a warning light, as a rescue beacon, and in any other emergency situations. 3 Operation Modes: Solid / Strobe / Flashlight. "Solid/Strobe(SOS)" when attracting attention, "Flashlight" when need illumation. Order this emergency roadside car flares for your parents,your wife,or husband and yourself. Put them in each vehicle in the family, just in case when they need it they are in the right place. 1, VISIBLE UP TO 3000 FEET AT NIGHT,UP TO 1000 FEET IN DAYLIGHT.Reduce the risk of accidents from roadside breakdown,warning oncoming traffic,especially in the rain or snow bad weather. 2, A MUST HAVE FOR EACH CAR, TRUCK, MOTORCYCLE,BOAT AND MORE.They last longer and are easier to use than standard hazard lights. Can be used in camping or hiking. No fire no fumes no fuss. 3, It can last approx 36 hours when batteries are fresh, AAA batteries not included. 4,Ultra bright red LED 360 degrees on the top reflective tapes on the beacon barrel. 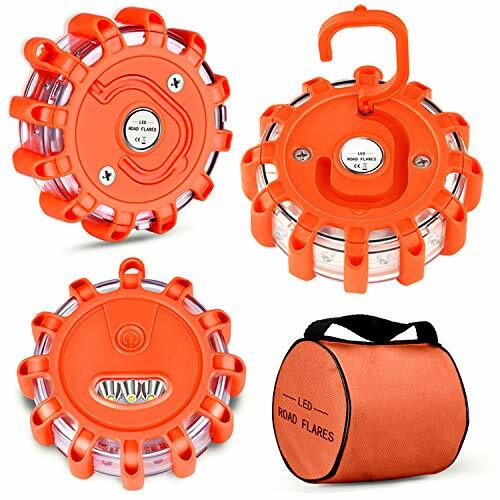 5, 2 LED FLARES IN STRONG DURABLE CASE -Which provide safe and secure storage from water or other damage. Tobfit 3 Pack LED Roadside emergency Flares lights work by visually alerting others with bright, flashing lights. Guarantee Your Safety and family members In Case Of A Road Accident; A real life-saver in case of a water accident, capsizing or similar emergency, our LED beacons are a must have for all cars, SUVs, Jeeps, motorcycles, bicycles and marine boats. 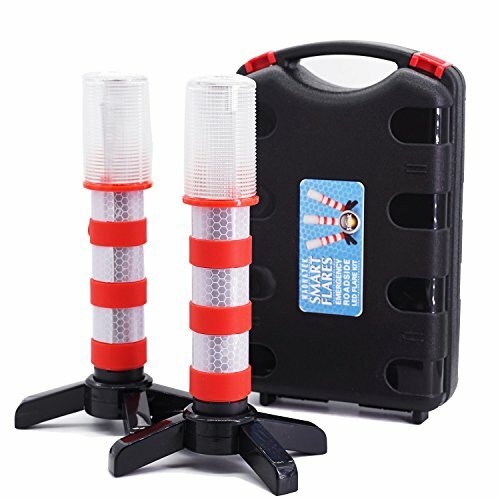 Pack of 3 LED Road Flares Emergency Light with Storage Bag great for dividing up among family members; A Perfect Emergency Kit to keep in the trunk of their vehicles for Roadside emergencies and distress situations. (We recommend AAA batteries to these LED flares light | BATTERIES NOT INCLUDED). corners and exiting semi trailers. is flexible Bright blue spot beam pattern projects onto the ground. Forklift blue light manufacture,each led has 50000 hours of life to help minimize maintenance. 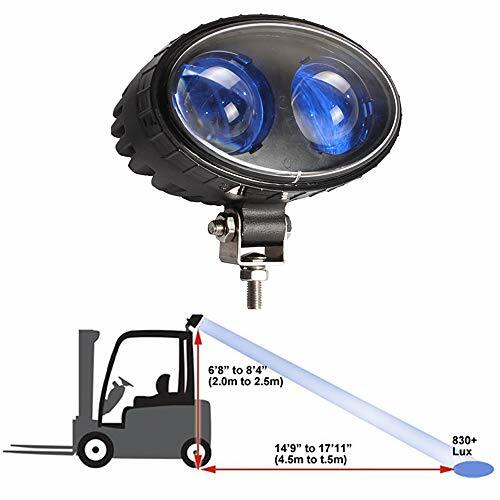 spot beam blue safety lights for forklifts or any industrial equipment and moving equipment. 1& A bright blue light on the floor to help remind pedestrians, loaders, unmanned vehicles and other industrial vehicles not close to forklift. 2& Mounted on the front / rear ends of the vehicle. 3& In the intersection, the corridor loud noise environment play a security warning is particularly effective. 4& The vehicle LED lamp strong beam is durable, life of up to 50000 hours. 5& Designed for forklift design of ultra wide voltage 10-100V general. Suitable for various battery needs. 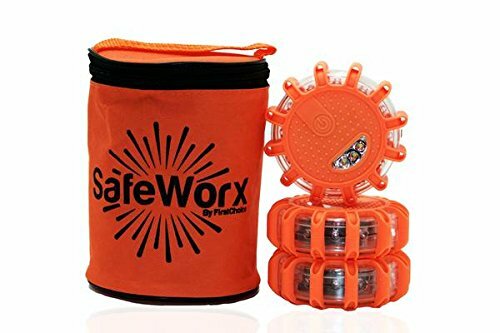 SafeWorx 3-Pack Road Flares With Carrying Case - When it comes to your safety, choose the best. -Safeworx Road Flares provide the most optimum and updated LED system to be seen within a 1-mile radius. -Use the Road Flares as a Flare, Beacon, SOS, Flashlight, or any other use that is needed. 3 AAA batteries are required for each flare(not included for safety reasons) and the battery life is up to 36 hours of use. If you are going to make a choice, make the safe choice, and choose FirstChoice SafeWorx. SlimK roadside emergency kit are widely used in failed vehicle traffic warning, police road mark, surface float and maritime salvage identifier, identification for emergency vehicle discovery, helicopter landing zone identification, large and heavy vehicle transport warning, rescue activity, emergency or temporary runway identification, campground or hiking route identifier, outdoor lighting, ect. 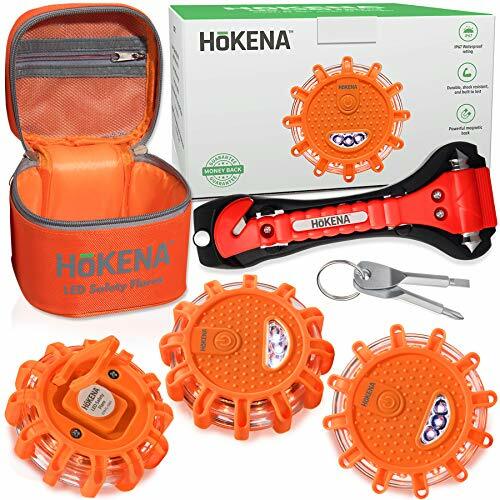 RECHARGEABLE DURABLE LED SAFETY LIGHT--, 700mAh rechargeable with a car charger or an AC adapter (Included), compared to the battery powered safety flares, it is more durable and environmentally friendly. Superior visibility LED Roadside Flares: Super bright LED array can be seen up to 1 mile at night;It can be used for traffic control, as a warning light, as a rescue beacon, and for any other emergencies. They can also be used for recreational activities such as camping and hiking. 9 LIGHTING MODES- Rotate, Tri-flash, Single flash, Alternate, SOS, Solid-on (high), Solid-on (low), 2-LED flashlight, 4-LED flashlight, multiple modes meet the different needs. Makes a Great Gift for First-Time Car Drivers, for farther mother sons daughters grandsons granddaughters and friends. 100% satisfaction guarantee. 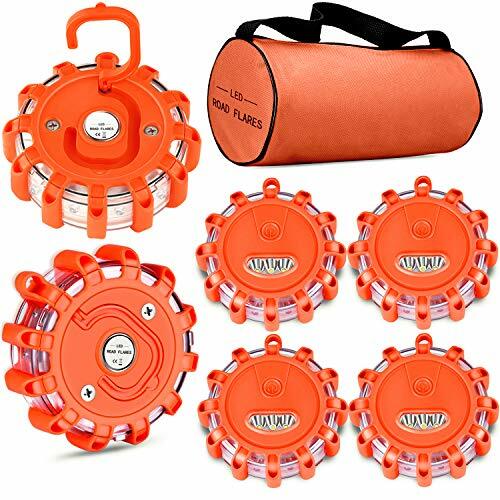 LED Flare Kit comes with 6 LED emergency beacons and storage bag. The LED Road Beacons produce red light with 360-degree visibility up to two miles away in different bad weather like heavy snow, rain, or fog. Each light has a 20-hour run time in steady mode, while it has a 60-hour and more running time in flash mode, vary in different flash mode. The LED Safety Lights are mutifunctional, and make a great addition to any emergency kit, garage, workshop, RV, boat, and outdoor adventures. Can be also using for bicycling, camping, motorcycling. 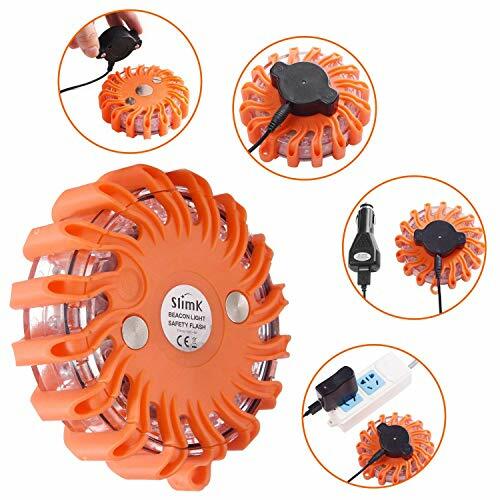 Perfect Replacement Emergency Alert for Strike Flares and Light Stick- The lights have a powerful magnetic base, can be easily attach to car, warehouse shelf, and are crush resistant, water resistant. SECURITYMAN EFLARESTAND LED ROADSIDE FLARES (2 PK) - DOT CERT. 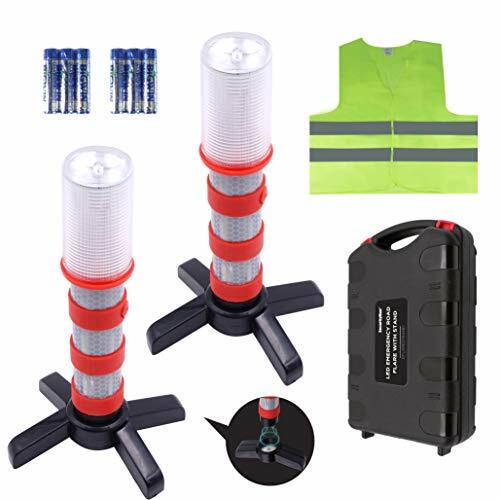 The SecurityMan LED emergency road flare kit includes two Spark-Free , battery powered electronic roadside flares for a safer alternative to incendiary flares. These roadside flares are unique in design and can be can be used as hand-held traffic control lights or as free-standing roadside warning flares to bring caution when needed. Each flare is equipped with 11 super bright Safety-Red LED s, 1 bright white flashlight LED, a magnet base and reflective tape on the barrel for maximum visibility. USE ANYWHERE | MAGNET BASE: * The mag base allows you to easily attach the warning flares on any metal surface (can also be used as a flashlight) * Use the electronic road flares for hiking, camping, first aid, or roadside hazards etc. SUPER DURABLE MAGNETIC STANDS: Detachable and foldable for easy storage, the magnetic base stands offer even better stability for rugged and uneven terrain AMAZINGLY BRIGHT VISIBILITY: * 3 different lighting patterns (Flashing red, solid red, & white flashlight) * 12000 Lux rating allows for up to 1 mile visibility * Perfectly seen in day or night * Each flare has 12 high grade LEDs LONG LASTING BATTERY LIFE: * 6 triple AAA alkaline batteries included * Has on/off switch to preserve battery longevity * Lasts up to 15 hours with nonstop flashing light WHAT'S IN THE BOX: * 2 mag base stands * 2 LED traffic flares * 1 Super rugged case * 1 neon green reflective safety vest * Quick and easy setup guide SPECIFICATIONS: * Power requirements: 3 AAA Batteries * IP rating: IP65 * Material: ABS, PC (Polycarbonate Plastic) * Reflective Vest Size: (XL) * Flare dimensions (LxWxH): 7.25"x1.63"x1.63" (w/o stands) * Case dimensions (LxWxH): 8.66"x5.31"x2.17" * Weight (GW/NW): 2.0lbs / 1.30lbs WORRY-FREE WARRANTY: At SecurityMan, we believe in our products. That's why we back them all with a one-year warranty and provide friendly, easy-to-reach support for any of your questions. 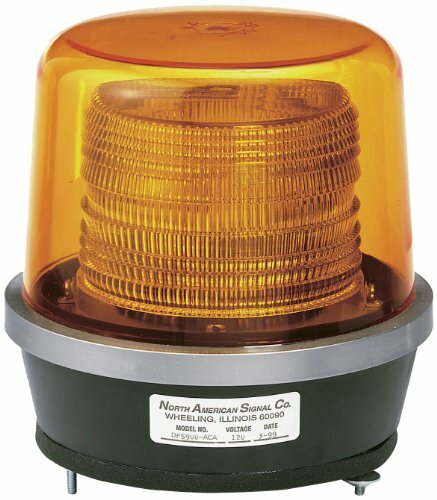 North American Signal class 2 double flash strobe light with permanent mount. 12/24vdc multi-voltage. Recommended for municipal, waste, utility and contractor applications. Measures 8-inches diameter by 8-1/4-inches height. 2 year power supply warranty. Foxfire portable signal light. 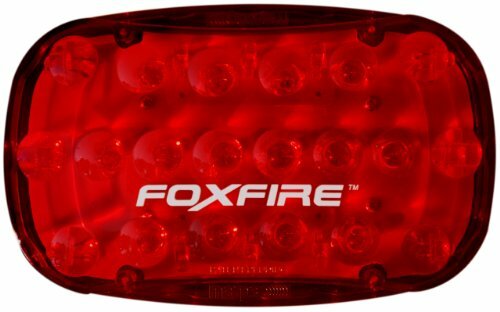 FoxFire is our most advanced signal lite to date. Equipped with 26 super bright LED's coupled with our patent pending LED magnifiers, the FoxFire brings hi-powered emergency lighting to any situation. This battery powered light features a polycarbonate lens and rugged contruction making it an extremely versatile option for emergency lighting on-the-go. Self supporting stand. Magnetic back. Polycarbonate lens. Rugged construction. Extremely versatile. Easy access to batteries. Uses and applications includes traffic control, work zone safety, warehouse and factory safety, disaster scenes, EMT, fire and rescue vehicles, utility vehicles, oversized loads, helicopter landing zones, crane and boom operators, farm equipment on open road. Measures 6" length by 4" width by 2" thick. Red color. 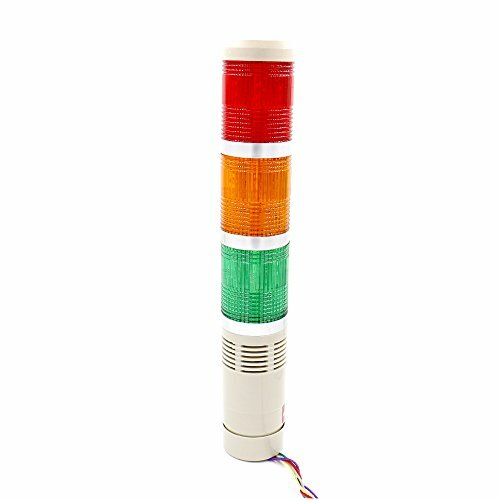 Features Green Red and Orange Light, built in Buzzer, Bright Light can be used a Signal Light or Alarm Light. It designed for displaying the operation status of machines tools, industrial machines, special purpose machines, automatic production line, robot, etc.